William King was born in 1968 in Katherine, south of Darwin, Northern Territory, Australia. His skin name Jungala of the Gurindji tribe. He developed his inspiration from where he was born. He spent majority of his time with his father (of the Waanyi tribe) and grandfather (of the Gurindji tribe) during his early childhood, who acted as both a teacher and advisor in many aspects of life. At 18, William relocated to Adelaide where he studied and finished an apprenticeship in carpentry. His heart was always with painting so returned to his love of art and began painting solely in 1994. In his early years he also lived with his Grandfather (of the Gurindji tribe) with whom he spoke of with great love and respect. His Grandfather had travelled widely across the desert and shared his stories with William and became both his mentor and teacher. He and his grandfather travelled Australia and developed a close connection with the land and passed down his stories and immense desert knowledge to William. William revisited his Grandfather’s country as a youth to learn more about his Aboriginal heritage. By the age of 27 William was developing a unique contemporary art style. In 1994 this led to his work being selected for an exhibition at The Gallery of Greater Victoria in British Columbia, Canada as part of the Commonwealth Games celebrations. William passed on Dec 2nd, 2007, his daughters Tarisse and Sarrita King continue his exploration for connection to all things through art. William endeavoured to create an enormous collection of artwork which exhibited in countless galleries around Australia and sold worldwide. William looked at nature with an artist’s eye linking his Aboriginal culture into his work. 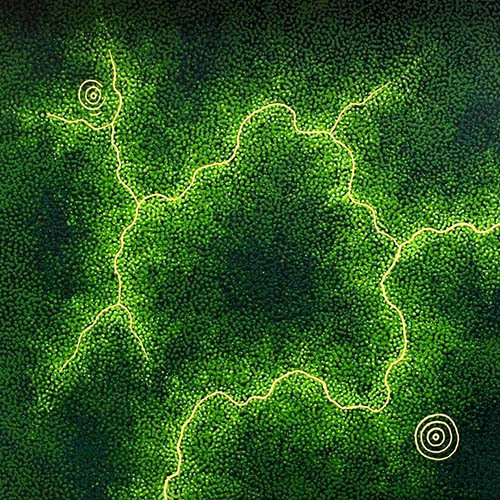 His technique was a mixture of contemporary, urban style and traditional Aboriginal painting. His vast, comprehensive philosophy of the ‘endless horizons’ enabled him to never be without subject matter. He painted in circular motion because he believed nothing had a beginning or end. The depth and intensity of his famous artwork still amazes and commands incredible respect from art lovers’ worldwide. William’s daughters Tarisse (born 1996) and Sarita (born 1998) are also extremely talented artists whom incorporate their fine abstract works exploring many facets of nature and echoing their father’s influence. William was able to express the philosophies of his people that lead him to create such magnificent paintings. He incorporated symbolic portrayals of four elements, fire, air, earth, and the wind. His expressionism and meticulous paintings were an ode to living in harmony with natural forces. This he learnt from his father, grandfather about life and living. His daughters, Tarisse and Sarrita have in turn been taught all this from him, resulting in their incredible painting skills and creative talent they have today. Both girls today have amazing careers in Aboriginal Art. Tarisse King was born in Adelaide, South Australia on the 4th September 1986. She is the older sister to fellow artist, Sarrita King and daughter to the late highly legendary artist, William King Jungala (1966 – 2007). Tarisse inherits her Australian Aboriginality from her father who was part of the Gurindji tribe from the Northern Territory. The Gurindji tribe came into the public spotlight during the 1960s and 1970s when members employed by the Wave Hill cattle station led a milestone case which became the first successful land rights claim in Australia. Similarly, Tarisse has proven herself to be is an emphatic young artist. She is unwavering to convey her passionate connection she has with her forefathers and the Australian land. Tarisse spent the most of her younger years in Darwin, Northern Territory. It is an area exposed to extreme weather conditions including intense humid heat which is literally immobilising in the Dry Season. In the Wet Season Darwin is subjected to torrential rain, perilous storms and cyclones (hurricanes). The dramatic weather Tarisse experiences has a major impact in her artwork. Another influence is from the experiences as a child travelling on road trips between Adelaide (where her father lived), Darwin and Katherine. The vast travelling of 3027 kilometres through the heart of Australia, uncovers vast expanses of fluctuating landscapes. The countryside she saw reflects in her paintings. The time she spent on these remote journeys gave her time to develop a unique perception of the land. Paintings such as Pink Salts, The Land, Blue Salts, The Bush and My Country – Tracks and Rivers. Tarisse moved to Adelaide, where her father William lived at 16 years of age. She became involved with his career in art and learnt so much from him. This of course lead to her experimenting with her own designs and techniques, resulting in a distinct style of her own. 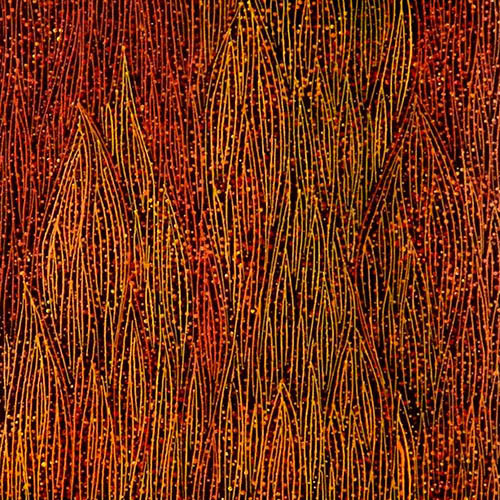 Drawing on the Central and Western Desert Aboriginal dotting style of painting the land topographically, Tarisse captures a multifaceted and varied soul of the land. Her adaptation of Earth Images emerged in respect and honour to her father. It illustrates Australia as if looking from outer space back to land. From a viewer’s prospective it is as if witnessing Australia from far above, drifting over the earth. 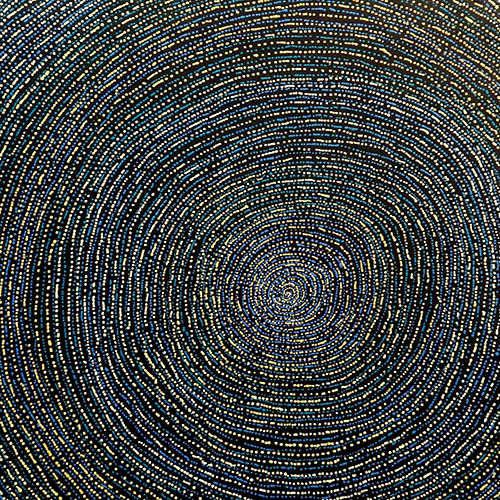 Her My Country series Tarisse creates 40,000-year-old Aboriginal iconography of song lines. With dots and circles she produces bold and modern visual artwork. It delivers another more detailed viewpoint on the landscape. Tarisse’s Fire series is also a technique she inherited from her father. He taught her that fire was the element that connected her to her ancestors and in turn her ancestors to the earth. The heat of the fire can be felt in these artworks and it is this feeling of warmth that her father said would be the same sensation her ancestors had experienced thousands of years ago. Tarisse learnt this style directly from her father who would represent the fire as a searing and burning heat. She however she reproduces this theme with comforting and enticing warmth. 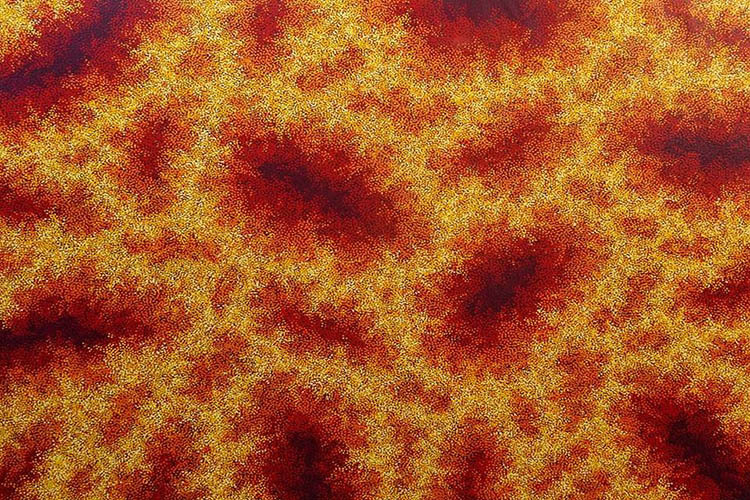 The thousands of red and yellow dots on each canvas create a nurturing glow that flicker around the canvas, producing an inviting optical effect. Like her father before her, Tarisse paints a Water series. She understands the life-giving properties water provides and feels this element in particular connects her to her father. The depth of water and the rejuvenating qualities it offers can be felt luring the viewer to her paintings. Technically, Tarisse captures the movement and shimmer of the water as seen from above through her varied tonal use of blues and whites. She paints aquatic peaks and troughs employing a condensation of dots to create the peaks and a sparseness of dots to reveal the black canvas below and represent the deep black waters and the shadows lurking underneath. They form such an optical effect the canvas appears to move and it is difficult to find a single focus point for long. Finally, Pink Salts, brings the viewer back down to earth and engages them in the dreamlike, glowing pink sunsets over the great salt lakes of Central Australia. In all Tarisse’s artworks, she contemporises the ancient and allows the current day viewer a simple moment to contemplate the past. Tarisse now lives in New Zealand with her husband and three children. She paints in her home studio while looking after her daughters, Amalii, Hinatore and Aorangi. At the age of 31, she is a full time artist. She has been included in over 20 exhibitions, is represented in galleries in every Australian state, included in many high profile Australian and worldwide art collections and been auctioned successfully through Paris’ Art Curial. Tarisse has so many accolades to her name at such a young age with potential to build on an already incredible career. Sarrita King was born in Adelaide, South Australia on the 5th March 1988. She is the younger sister to fellow artist, Tarisse King and daughter to the late famous artist, William King Jungala (1966 – 2007). Sarrita inherits her Australian Aboriginality from her father William King Jungala. He was part of the Gurindji tribe from the Northern Territory. The Gurindji tribe came to public awareness in the 1960s and 1970s. Members of the tribe working for the Wave Hill cattle station initiated and won a landmark court case. Their actions led to the first successful land rights claim in Australia. Sarrita has the same determination of and pride that exemplifies her drive to paint her totemic landscape. Sarrita spent most her youth raised in Darwin in the Northern Territory. This is near where her ancestors lived. It is here that her link to her Aboriginality and subsequently the land was able to grow. She was exposed to extreme weather and rugged landscape. This provided the theme for her works of art, since she began painting at age 16. Rolling sand hills, cracking lightning and thunderstorms, torrential rain, fire, desert and tangled bush are all fierce environmental factors that shaped her forefather’s lives and her own. By portraying these elements in her paintings, Sarrita provides a visual expression of the earth’s often harsh environment. 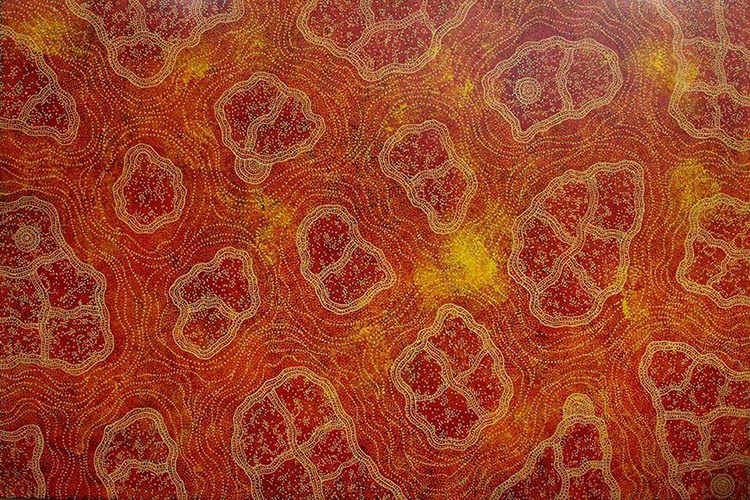 Through Sarrita’s painting style she applies traditional Aboriginal techniques such as ‘dotting’ but also incorporates unconventional techniques. Sarrita learnt these from her late father, as well as self-taught methods. Sarrita creates intense energy on the canvas with her Lightning series and searing heat with her Fire series. Her art is a combination of the past, present and future. It embodies the next generation of artists who have been motivated by both their indigenous history, and present Western upbringing. Her artwork has a worldwide appeal and provides an entry point for people to experience the power and uniqueness of the Australian landscape and its harsh climate. On a universal scale, her paintings couldn’t be more seasonable and well-timed. 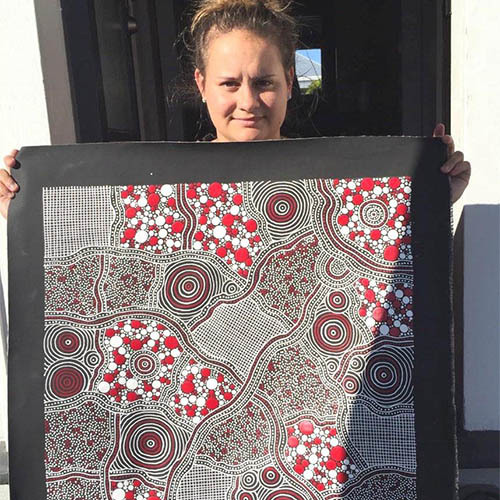 After many years of painting imagery and stories inspired by her Aboriginal culture, Sarrita has decided to express some of the more universal concepts and philosophies taught to her by her father, the late William King. In this first series ‘Connections’, Sarrita has focused on 3 iconic elements of our world that all people can connect with and use to connect with one another, regardless of their race or culture. The Sun, Our Land and Ancestors are understood by all mankind and hold a significant importance to everyone. 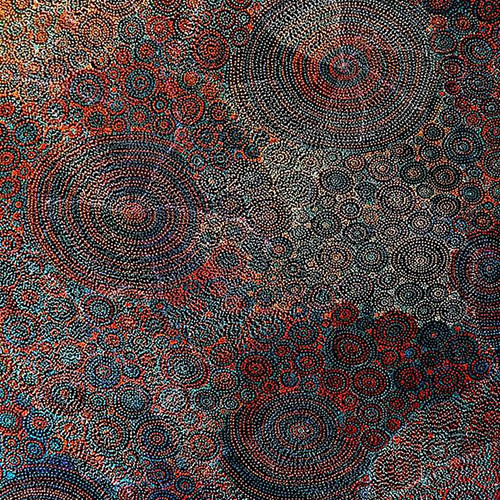 This ‘Ancestors’ painting, is layered with dots. Markings made on the land over thousands of years can be seen entangled with patterns covering the land today, such as sand hills, flora and paths made by humans and animals. Beneath the land are the waterways which have been virtually constant over time feeding the land, the flora, fauna and humans. These are the same waterways that supplied our ancestors which are now one with the land. Sarrita paints the naturally occurring waterholes she remembers travelling around Alice Springs and Katherine. The scarcity of drinking water in certain regions means specific knowledge of where these waterholes are located, as well as their preservation methods, is paramount to survival. Today, Aborigines speak of where waterholes once were, as many of them have dried up due to drought or diminished maintenance. Her Water series is Inspired by the different geographical water formations, these paintings seek to mimic the movement and colours of this life-giving element. Listening to her father explain the importance of water to the Aboriginal people and its culture, Sarrita feels this element in particular connects her to her dad. 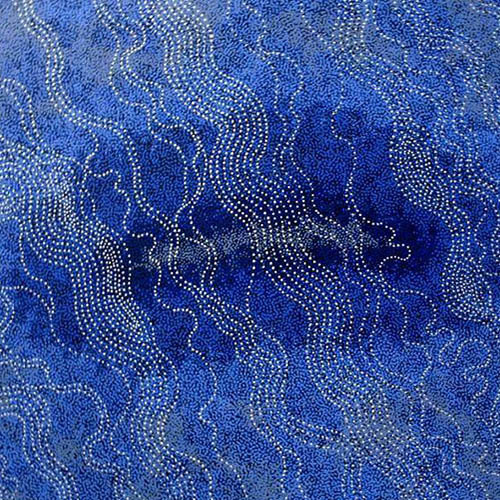 Sarrita often uses metallic paint to define the shapes and ripples caused by the movement of water. They highlight a background of shades of blue or black and create visual motion diagonally across the canvas. Sarrita’s career is extensive. 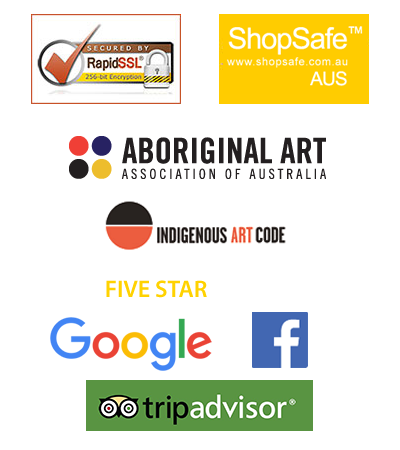 Her paintings have been included in over 30 exhibitions, in many high profile Australian and international art collections and represented in galleries in every Australian state. Her works have been sold successfully many times through Paris’ Art Curial Auction house. After living and painting in Canberra for 3 years, Sarrita and her partner returned to her childhood home of Darwin in 2017. The couple have since welcomed their first child to the world, a boy, Steele. Sarrita King at only 30 years of age has already had an incredible career with so much more to come. 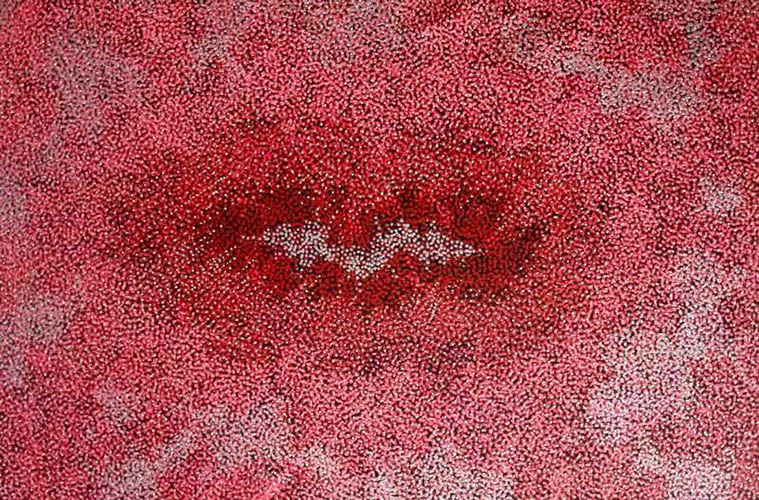 It is her aspiration to visually share her creativeness through the Australian land that keeps her ancestral cultural story alive. It is an artistic way of preserving her ancestral background whilst bringing it forward to the present to share with art lovers worldwide. It is innovative way of looking back while looking forward. The King Sisters sometimes collaborate to produce some outstanding pieces together. Paintings such as “Our Country’s Story ~ Collaboration” which is truly just a sensational combination of these two exceptionally talented sisters.